Upward Bound (UB) keeps 75 1st generation-eligible-for-college, low-income Kearny High School students in school and bound for college. UB participants complete courses in literature, composition, mathematics, science, and social science. Other preparation for college, includes tutoring, intensive advising, counseling, field trips, SAT prep, and a 5-week summer residential program at USD. USD UB has received three consecutive awards from the US Department of Education ($880K in 1999, $$968 K in 2003 and $1M in 2007). 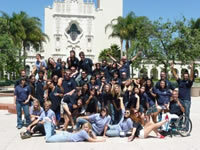 In May 2003 USD UB graduated its first cohort of high school seniors, and in 2007 they began to graduate college. USD UB is one of 760 Upward Bounds currently in operation in the US. Staff: Cynthia Villis, Ph.D., Director; Cristina Aguirre, Assistant Director, and Anayensi Jacobo, Academic Coordinator. The McNair Scholars program currently intensively mentors 25 1st generation, low-income USD students in a variety of majors through their undergraduate years and into graduate school, expecting that they will achieve a Master's degree and/or a Doctoral degree. It includes a summer research mentoring program at USD, loan of a laptop computer, field trips and travel to graduate school sites. One of 177 McNair programs in the US, in June 2003 USD McNair received its first 5-year award ($1.1 million) from the US Department of Education. In 2007 its second cycle was funded for $900K. Staff: Cynthia Villis, Ph.D., Executive Director; Noel Salunga, M.A., Director; Shelley Barajas-Leyva, Academic Coordinator; Ramiro Frausto, Administrative Assistant. Student Support Services (SSS) is sponsored by the U.S. Department of Education and USD and identifies promising students and prepares them for leadership in their college-level work. SSS specifically serves 320 USD students who are first generation to attend college, low-income, underrepresented and/or disabled. SSS provides a comprehensive range of academic support services including tutoring, basic skills workshops, strategic advising and counseling, mentoring, cultural activities and supplemental instruction. Participants' academic skills are enhanced and their rate of retention and graduation increased. Nationally, students in TRIO Student Support Services programs are more than twice as likely to remain in college than students from similar backgrounds who do not participate in SSS. There are currently 953 SSS programs in the US. Staff: Cynthia Villis, Ph.D., Executive Director; Sara Boquin, Director; Rachel Acosta, Academic Coordinator; Freddy Delgado-Wong, Academic Coordinator; Anastacia Bronner, Academic Coordinator; Ramiro Frausto, Administrative Assistant; Rabecca Bernhardt, Administrative Assistant. Rotary District 5340 Liaison provides USD collaboration and support to Rotary-sponsored programs: Rotary Ambassadorial Scholars to the Joan B. Kroc School of Peace Studies and the USD MA in Peace and Justice Studies, liaison to the City Heights community (including the City Heights Sewing Project), San Diego~Jalalabad Sister Cities Committee (hosted the meeting of Mayors Arsalai of Jalalabad, Afghanistan, and Murphy of San Diego, November 2004), the District Pathways for Peace Committee, Group Study Exchanges (hosting at USD educator teams from East Africa, Ecuador, Afghanistan), University Teacher Grants, leadership training to the Preuss School Interact Club, and other projects, seminars, conferences, and programs. Advising the USD Rotaract Club: The USD Rotaract Club is one of 7000 Rotaract Clubs world wide. USD Rotaract (along with the Rotary Clubs of Coronado, Del Mar and La Jolla Golden Triangle) has been an active service force on USD's campus and grows stronger every day. 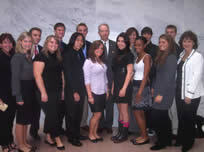 In the Spring of 2010 USD Rotaract received its first Presidential Citation award for the 2009-2010 Rotaract year. USD Rotaract was recenctly featured in USD's student run newspaper "The Vista" for their participation in the 1000 Smiles Clinic. 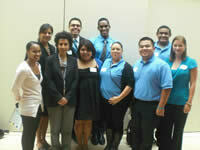 The ICI provides an advisor, Cynthia Villis, Ph.D to the USD Rotaract through the La Jolla Golden Triangle Rotary Club. Expanding Your Horizons is USD's collaboration with 15 San Diego organizations, providing an annual conference to engage 600 girls in Grades 6-10 in math, science and technology, and follow-up events throughout the year. Global Leadership Connection recognizes and fosters high idealsof leadershipand integrity among American youth through leadership development programs and scholarships. The top TRiO students are invited to an in-depth Washington DC experience that has included meetings with Georgetown University International Relations faculty, a Senator, the Director of the OMB, a CIA intelligence analyst, the Director of an international NGO and those on other international career paths. The Global Connections and Exchange Program (GCE) in Afghanistan promotes collaborative partnerships between secondary schools in Jalalabad, Afghanistan and secondary schools in San Diego, California through Facebook and Ning sites and Skype calls. Providing Internet access and training, the program encourages teachers and students in learning, research, and free expression through thematic online projects to prepare for college and vocations, thus founding Afghanistan’s first Precollege Institute. Interest in college and vocational school, and subsequent enrollment for Afghan participants – particularly girls - is of special interest, as are the aspirations of teachers and families. The grantee, the La Jolla Golden Triangle Rotary Foundation, has six years of successful projects in Afghanistan. It forms GCE with strong partner schools and community resources in both countries. These partners include San Diego-Jalalabad Sister Cities Foundation, Moini International Consulting, San Diego State University, Nangarhar University, Nangarhar Department of Education, University of San Diego San Diego Science Alliance, and La Jolla Golden Triangle Rotary. Afghan faculty are trained in-country, and at an institute in San Diego. The GCE program trains teachers to teach their students project planning, evaluation, and research. GCE addresses the goal of civil society by focusing on achievement through education, with issues of ethnic and religious tolerance, gender equity, community service, rights, activism, responsibilities, and law. Support to teach English, mathematics, science, and general education in Afghanistan is key, as is developing familiarity with the Afghan people and culture for those in the U.S.
San Diego and Jalalabad schools interested in participating in this project may contact Cynthia Villis (villis@sandiego.edu) for more information.